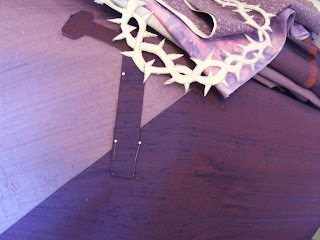 The very purple Lenten antependium is waiting for a few hand finishing stitches to be added tonight in front of the TV. It's on now to the next piece, for Good Friday. It's a real privilege to stitch paraments for Good Friday as often churches simply leave the space bare that day. The actual colour in the church calendar for the day is black. Having no black silk in my stash (and no where to find it in Amherst late on a Saturday night) I was asking around to find some dupioni, thinking the slub in that cloth would be a suitable texture. I happened to ask the right person because even though Beth had no black silk, she did have this piece with an amazing network of lines resembling thorns....or cracks and fractures...all appropriate messages for the occasion. Thank you, Beth. I could not have dreamed of finding anything more perfect. Today's warmer weather (and by "warmer" I mean it was only -10!) 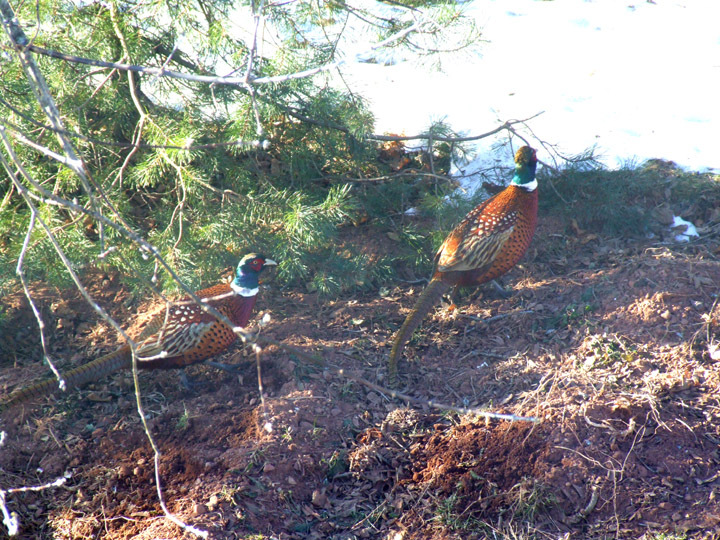 brought some handsome visitors to our backyard. 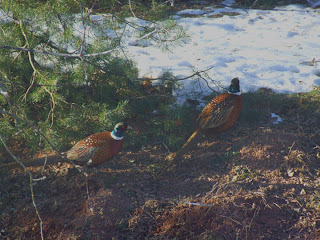 These fellows took their time strutting their stuff just outside the kitchen window. Inside, the kitty teeth were clicking away; I expect Polly and Maddie were thinking "great - one each!" After a couple of false starts, the Lenten antependium seems finally on track. I've auditioned several themes and many shades of purple in getting the design to suit. (I was tempted to write that I have struggled through Lent, but wasn't sure if that would be taken to mean something darker!) It's a process to get a piece to where it says what you want it to, and not an unenjoyable one. The brain keeps as busy as the fingers. Anne was asked to teach the workshop again to a neighbouring guild in Antigonish, The Nova Scotia Highland Quilt Guild (and again, Anne did the right thing and purchased patterns for all participants.) I received these pictures of the first finishes, and was pretty much blown away by this one by Jeanine Gunn. Jeanine obviously knows a thing or two about colour - wow! 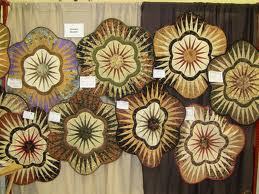 Three others are just as spectacular (notice the butterfly appliquéd in the centre of the one on the far right?) These look like bright, sunny flowers. 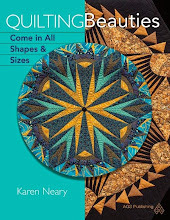 The beautiful creations are by (l-r) Jeanine Gunn, Elizabeth Munroe, Linda Kell, and Yvonne Lynch. Thanks to all for sharing pictures, and a special thank you to Anne who is obviously a stellar teacher! 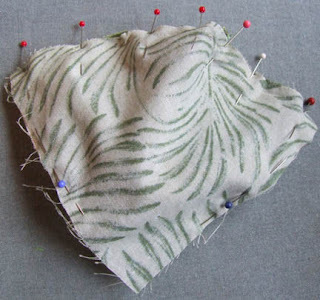 So often I hear folks say that they would never be able to sew a curved seam such as in a New York Beauty block, and are too intimidated by the thought to even try. 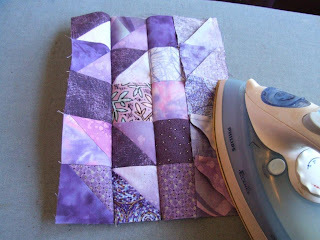 In reality, these blocks are not a bit difficult as long as you can sew a good, consistent 1/4" seam - as in straight patchwork. I took some pictures of the process for Marg a couple of weeks ago and thought that I would retake them and tidy them up a bit for posting here when time allowed. (ha!) 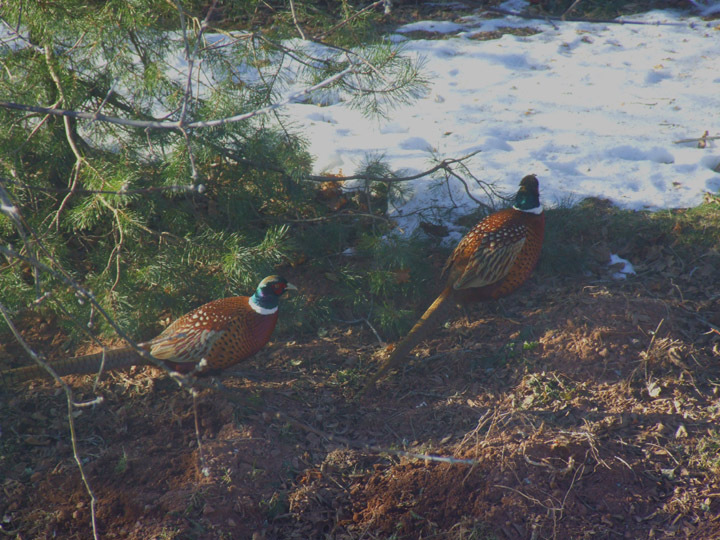 Since there are no more hours in the day in 2013 than there were in 2012, I have decided to post these and ask you to forgive the crooked shots. The block below is the same one used in Roundabout Again. 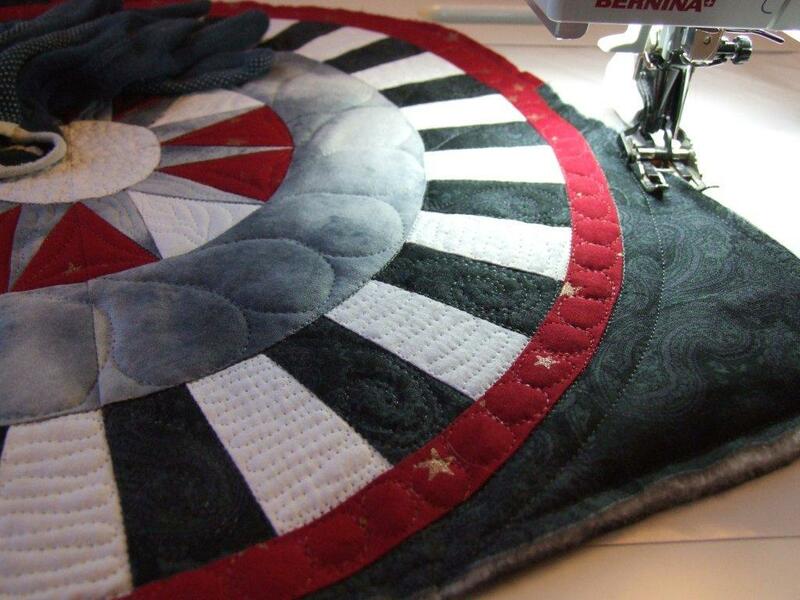 I have my regular 1/4" piecing foot on my sewing machine. In the picture below, the space inside the green tape measures 9-1/2”, the unfinished size of the block. You can see that the pieced foundation arch reaches to the 8” mark on the mat. 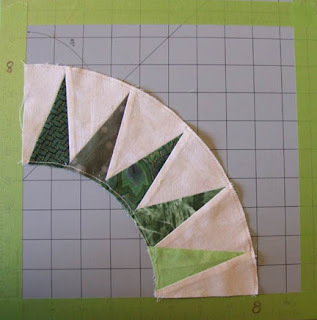 Since this arch is foundation pieced, you know that it is the exact size it should be; use it as a guide to line up the edges of subsequent block sections. 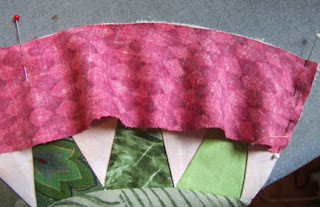 After you have stitched the spikes and carefully removed the foundation paper, stay stitch 1/8” from both curved edges. 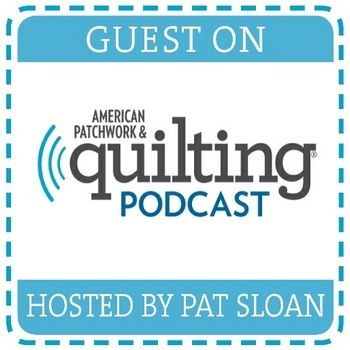 No doubt you remember stay-stitching from Home Economics class; it will not show in your finished work but it helps keep the curved edge smooth in the sewn seam. Don't fuss over sewing a perfectly straight line, just make sure it is within the 1/4" seam allowance. Match these centre points and pin. Place a pin at each end. Now...If you look closely along the right hand side of the block, you can see where the centre quarter circle is pulling in. 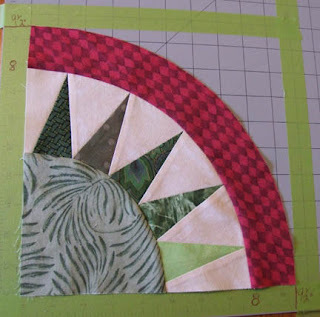 This is usually where the problem lies in having your block come out wonky..
To keep your block true along the edges, pin down both sides at the end of the piece you are adding. I flipped the patchwork over in the picture below so you can see that I am pinning down along the edge of the pieced arch unit. 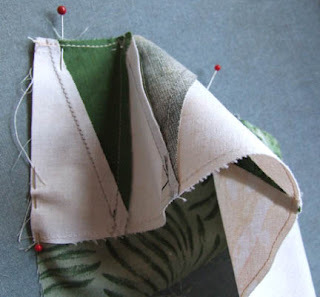 You will not be sewing along this edge, the pin just keeps the fabric from pulling in as you stitch along the top curved edge. You will remove the side pins as soon as your curved seam is sewn. 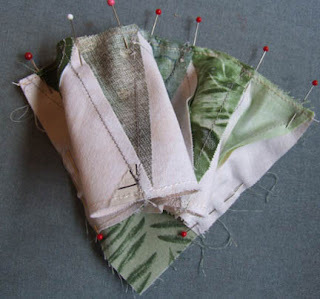 Make sure you pin both edges. 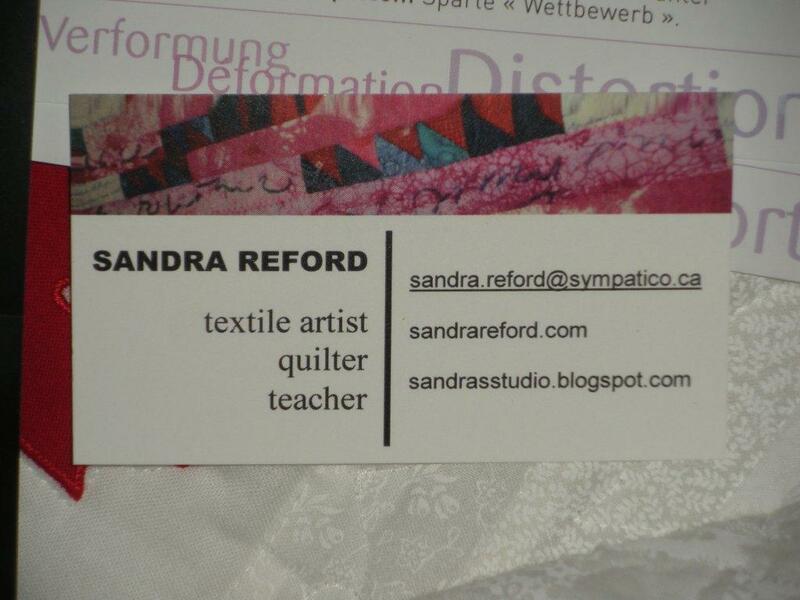 When it is pinned, it will look like this (below). 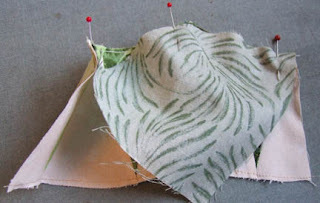 The blue headed pins are those holding the fabric to the edge; again you are not sewing that edge, just the top curved edge where the red-headed pins are. 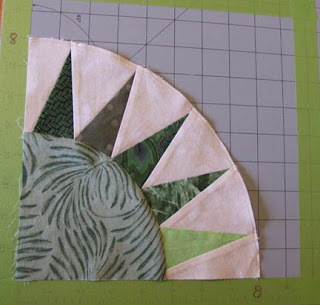 When I am ready to sew, I flip the piece over to the other side. 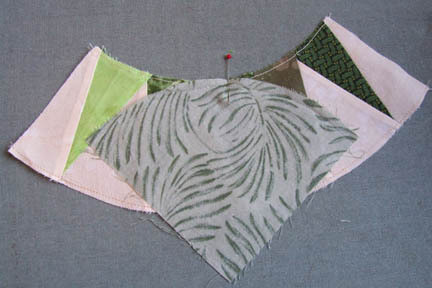 Even though we were told in Home Ec class to put the fullest side on the bottom so the feed dogs could ease it in, flipping it over to sew has 2 advantages: the fullness is now on the top, so you can see if you are stitching any tucks or pleats under your needle, and also you can see the seam where the spike ends, so you know that you should not be stitching past that area for your perfect points. I pressed the seam towards the centre circle, but would alternate the direction I pressed in the adjoining block You can see how straight the edges are – without trimming. 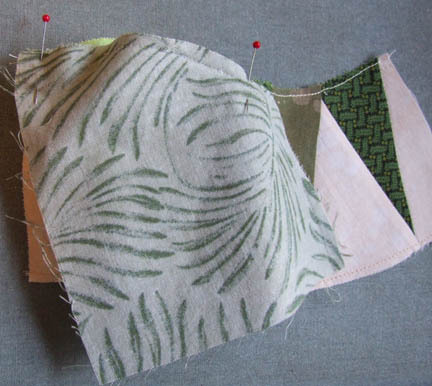 I add the outside arch in the same manner – pinning first at the end of the stitching line, and then along the side of the piece I am adding. 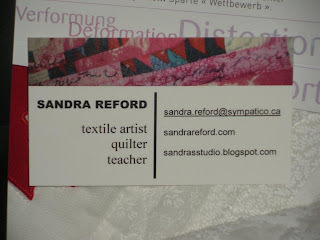 (see the white pin along the right bottom side of the red fabric? That holds the edge of the arch true and straight while you stitch along the top curved edge. 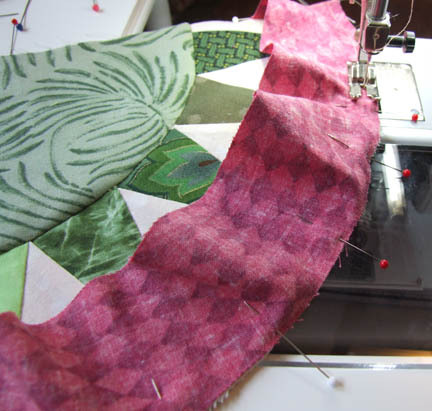 If you have “needle down” on your machine, it’s nice to enable that function; stitch up to the pins and remove them as you get to them. Needle down helps keep the fabric from shifting. 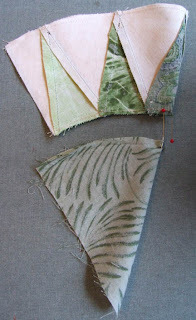 Again notice that I am stitching with the fullest piece on top. I press this band away from the spikes as there is less bulk. Despite the rather crooked picture, you can see that the edges of this block have stayed nice and straight and it has come out to exactly 9-1/2”. (I hate trimming!) For me, the trick is all in that side pin. For the blocks which call for the background section, I add it exactly the same way. kindly included programs and advertising from the show. These will go in my book of memories for when I am an old lady. 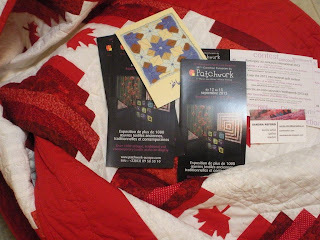 When the exhibit in France was over, Sandra arranged to hang the show at the Joshua Creek Heritage Arts Centre in Oakville, Ontario for two months. She did an amazing job. Polly and Maddie were happy to examine the box for any contraband when it arrived. ...And of course, Polly didn't stop there. She needed to inspect the quilt also. I am happy to have this well-travelled quilt back home. It feels like an old friend has returned. After two whole days of blissful, just-for-fun sewing it dawned on me to check and see when Easter is this year. Naturally, it's extra early. This means the next antependium is due to hang on February 13, the first day of Lent. I need to start thinking in purple. It's been a mixed up month of Sundays. Last week, the dedication of the New Year's antependium was postponed because of a snow storm. The plan was to do it this Sunday along with the one for Epiphany. 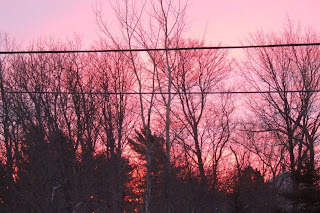 Because of another forecast of pending snow and an early morning sky that looked like this, we hit the road early to deliver youngest back to university. 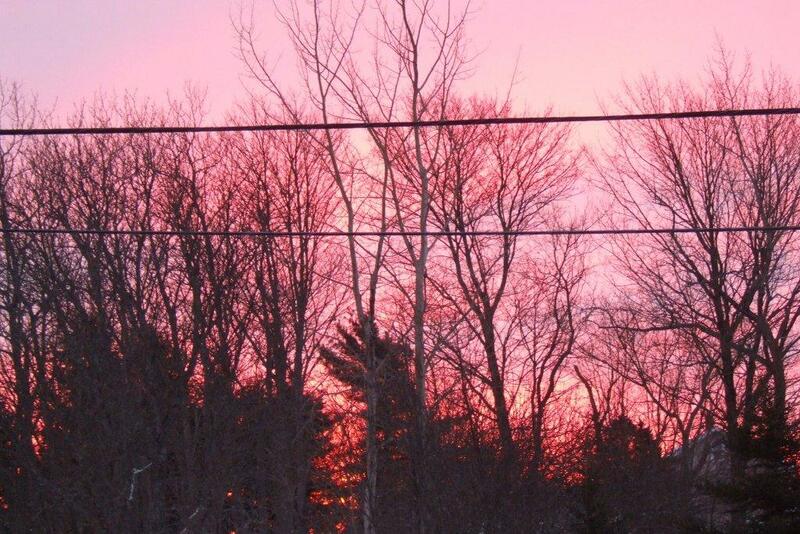 You have to respect the wisdom that quipped, "red sky in the morning sailors take warning." I have to add that when I think of this line, I also recall when we taught eldest son the corollary of "red sky at night, sailors delight." He watched and waited for his first time to say it and excitedly came out with, "Red sky at night, pizza delight!" (For those unfamiliar, Pizza Delight is a local restaurant chain!) Thankfully yesterday we managed to return home without incident in the first of the snow...but missed the dedication service. Here's the one for New Year's, which was a difficult assignment. I ended up stitching this one three times before I was happy with the results. All the colours of the liturgical year are included - red, purple, green and white - with white predominant as that is the current season. 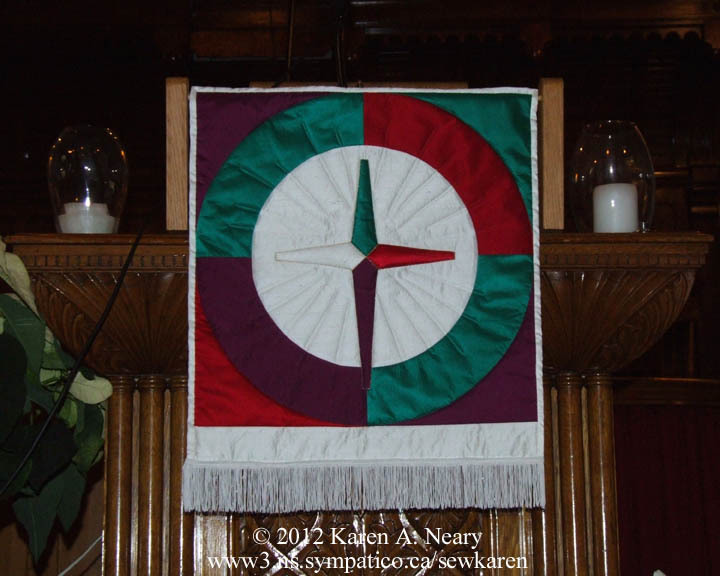 The central motif is a blended cross/star, merging the two main symbols of the Christian year. 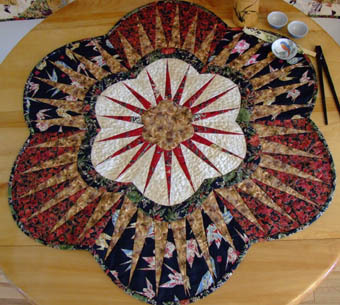 The antependium is pieced of silk habatai and, although you cannot see it well, is quilted in a "palm tree" fireworks shape in the white centre circle. 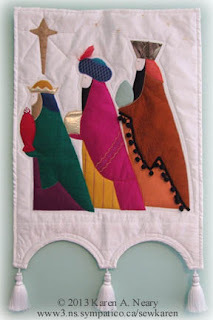 The Magi for Epiphany was a fun, colourful piece. I decided to let the kings fill the width of the space in an almost comic book/caricature look. My post last week which was entitled "Magi-cal Mystery Tour" was tongue-in-cheek because they remind me of the Yellow Submarine figures. 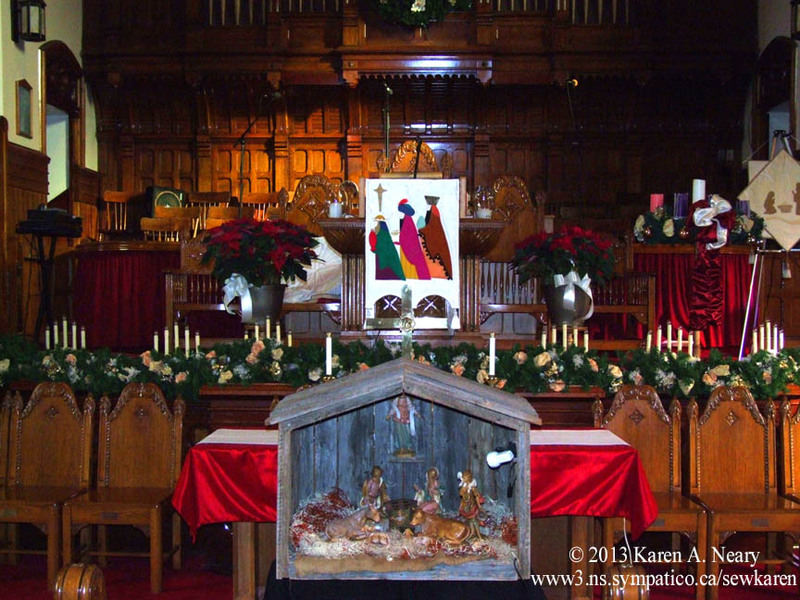 It was fun to glitz the wise men up a bit, but in an exaggerated way; there really is no point in fine detail as you want it all to be seen from the back of the church. The king on the left has a pin tucked top on his crown and silver drageés stitched on his gift. I was stumped finding a feather for the turban of the central king. 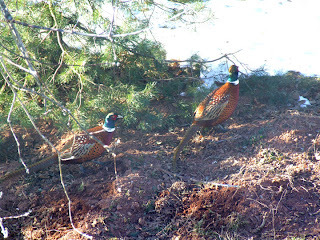 I visited both craft and sewing supply stores to no avail; no one had packaged feathers. Finally a store in Truro told me the only feathers they had were in 8 foot long boas. That's a lot of feathers when you only need one...Sigh...As I stood deciding which colour of boa I would be adding to my wardrobe, I spotted 3 red feathers on the floor beneath the display. I quickly asked the clerk if I could have one, and she laughed and handed it to me with her blessing. It would normally have been swept away, thus literally one man's trash being another's treasure. This king's gift of gold is topped with a shiny gold sequin. 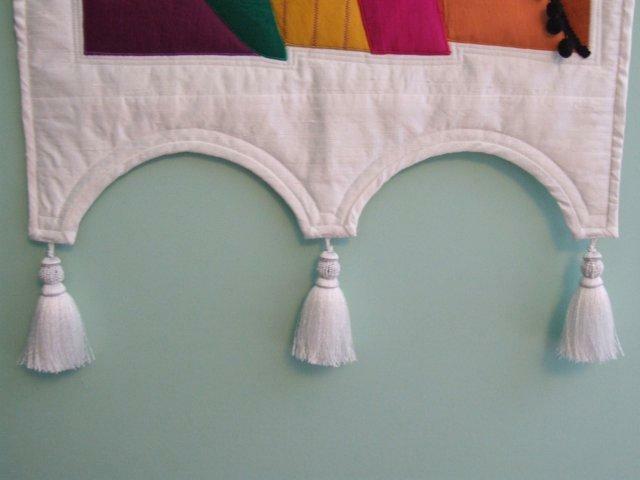 The third and tallest king has a small beaded tassel on his cap, as well as a balled fringe trim. The bottom was cut to resemble the roof line of a castle. Other than gold lamé for one gift, the kings are stitched entirely from Chinese silk on a silk dupioni background. They add a splash of colour to a season of white. Because of an idea by Beth Munroe (of Mrs Pugsley's Emporium fame), we celebrated the dawn of a new year in a unique way last night. Beth suggested that the townsfolk all gather in the newly renovated Victoria Square just before midnight to see the new year in together. It was fun to stand in the bandstand in the cold (-9, I think) and make lots of noise. There was a big clock to help countdown the minutes. It was a great idea for a community event and I hope it is repeated in years to come. 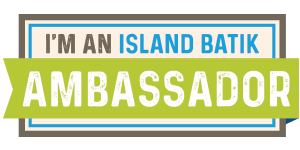 Thank you Beth for all the amazing things you make happen here in Amherst, Nova Scotia.